In March 2011, Lora and I (Joan) were newly certified Restorative Exercise Specialists™. We could not wait to share what we had learned so we offered to give back to our community by providing a free weekly class at our local senior center. We called the class Aligned and Well. We had an amazing turnout at the beginning and it has continued over the past seven years to be a very popular class. Some of our original people are still with us. One couple, Ian and Chandra James joined us early on. Ian continues to be a regular after the passing of his beloved wife in March 2017. The following is an unsolicited and mostly unedited testimonial given to us in 2016 by Ian aka Sucinno who has become a dear friend. I began showing symptoms of PD about a year after my son Alisdare died of a brain tumor. I mention this at the start as I think it significant in the onset of the disease, and will return to it later. I’ve never been inclined to go straight to the doctor with health issues, preferring at first to observe and determine just what I think is happening. Having had an involuntary tremor since early childhood, I was no stranger to shaking and mild hand control challenges, so I lived with what I observed to be a ‘new’ tremor arising within my body from a different source than the existing shakes. A year later, 2003, I made an appointment that resulted in the diagnosis of PD. At that time I was advised to remain off PD drugs for as long as possible (until the condition worsened), as they had a limited span of effectiveness. I am writing this report in 2016, and am still PD drug free. Whilst over the course of the last thirteen years I have worked consciously to alleviate the effects of PD in my system, a part of my being able to function without resorting to drugs I attribute to the last five years of attending Aligned & Well classes. This report essentially covers that four-year period, with some pertinent background information. I was born in the middle of a war, bombs were dropping and I was apparently reluctant to arrive. Pulled in hurry with forceps, damage was done, but would not be detected until I was a child with a tremor. Growing up I learned quite naturally — as everyone with a ‘condition’ learns — to hide it in inventive ways even from myself. When I was diagnosed with a ‘different’ tremor as a symptom of PD it was time to ‘be with’ the whole-body condition. Between the first tremor and the second I’d led a varied life pattern among which was considerable time in a Buddhist monastery, where I discovered the (first) tremor ceased when I was in a particular meditative state. What I learned from this experience was the intrinsic connection between mind and body – they are as close as breathing and one’s lungs, but the key understanding lay in the realization that it is the mind that controls the relationship. So, on being diagnosed I looked to my mind for both the cause and resolution to PD (at least my PD!). The cause reached back to my traumatic birth, a near death illness at two years old, and the death of two of my sons — the first (at three months old) when I was twenty-four, the second (at thirty-six years old) when I was fifty-nine. This ‘line of causation’, as I came to recognize it, meant I had to face death and learn what it had to tell me about (my) life. Thus, I began a study I continue to this day. Like everyone I want to live as full a life as I can. I believe that is not possible while we are unable to face our inevitable death. Getting a serious diagnosis places one potentially on the road facing in death’s direction. The key to death acceptance is letting-go. It is also the natural key to use in unlocking the hold a disease has upon the body, or any other unconscious function. Letting-go is simple, but it’s not easy. At the monastery the abbot would say – with a smile, “You have come here to let go, to die before you die so that when you die you do not die,” and then he would laugh. When I started Aligned & Well classes, we began with walking and soon realized we all walked a little differently in a manner we had learned as children from copying our parents. Very few of us had an economical (healthy) walk pattern. (My father had polio as a child, I copied his walk — I walked like I had had polio.) Between the ‘polio’ gait and the PD shuffle I had a long road ahead. I reasoned that if I could let go of my tremor by using my mind, I could let go of my dad’s walk and Parkinson’s shuffle. As soon as I thought of Parkinson by name I personified ‘him’ in my mind, and decided we were two people in one body (strictly speaking in one mind), and he had come to stay. And my father was still around somewhere, so the situation became very interesting. Parkinson would want to walk one way, while I would want to walk another. I compromised, gave him his time; to shuffle, stutter, tremor, choke (I didn’t exactly ‘allow’ that one), and lose his memory from time to time. But when it was my turn to have the body I let him go. Of course, as the new owner of my body — as he saw it — he resisted my letting him go. The key then, was not to fight, but to remain concentrated upon my own body actions. The Aligned & Well classes laid out just what actions to take, in what order, and repetition required, to re-arrange one’s walking pattern and whole-body function. These were not specifically designed for a PD requirement, but for anybody and everybody who is not functioning with optimum energy efficiency and health promoting movement. I learned the ‘Monster Walk’ — approaching the task sideways on, heel down first, keep the feet straight maybe a little pigeon toed! “Try starting with fifty steps a day, work your way up to two hundred.” Great if you’ve got nothing else to do. Then there’s the standing against the wall trick – can’t stand straight against a wall on account of a ‘dowager’s hump.’ So, there’s this thing we do lying on the floor with a half foam roller under the upper back, then rock 10 times side to side, and repeat up and down the upper spine and behold next time against the wall, straight as a plumb line – after about three years of practice. Not fifty a day though, just two or three times, that’s reasonable. Squeeze them in between monster time. Lots of interesting new words come out – ‘ishial tuberosity’- spell it! Can’t hardly say it. I’d tell you more but I can’t remember them. The important thing is I can do stuff Parkinson can’t, because I learn and ‘he’ doesn’t, I have awareness I can use, he doesn’t. For anyone taking on this form of alignment re-training of body function, I would advise imbibing an understanding with regards to concentrated awareness of ‘who is walking today,’ and ‘who is in charge of functioning.’ It could be your mother or father, a past unresolved trauma, the latest feet fashions, a Hollywood copy-cat, negligence, apathy, anger — or it could be you now, because you let-go of those ‘others’ that have taken over your body, and reclaim it for yourself. Parkinson and I live quite amicably together now. ‘I’ am stronger than he is through greater intention, and attention to the needs of ‘my’ body, whereas his only intention — if he has one – is to take me down that road to death. As I have accepted that path, there’s less for him to do — but he keeps trying! Yes, there is a lot about dying here, and that may be challenging, but without a real conviction to Let-Go, that is to die to the old self, one will never develop a new form and function. And by the way, when that new form arrives, celebrate for your life, but don’t grasp so tightly that you reflect a fear of death – there’s a lot more to being relaxed enough to be Well and Happy than one may think. “Joy Is” Ian and his lovely wife, Chandra. ‘Signposts’ – A way out of confusion by Ian James. 1982 (out of print). A work therapy manual for some of my clients when I was a psychotherapist. ‘Walking Between Trees’ – A journey to kindness by James Owen. 1999 (Available on Amazon). A biographical ‘story’ of James Owen’s Life Journey. ‘Last Writes’ – Prose and poems of Love, Dying, and Death by Ian James. 2017 (Available on Amazon). Reflections during the hospice time with my wife Chandra. ‘A Mala for Chandra’ by Sucinno. 2017 Limited edition for family and friends. 108 short mala ‘beads’ – reflective poems of love. What a glorious story, i wish you well and Thank You so much for All you have shared! In the Hatha Yoga that i teach and practice, we too practice “letting go’ – nonattachment, so as to not hold so tightly, to past and future and even present, to alleviate the suffering that all that clinging can bring and to be just were we are – in the present, each breath a gift – and at the close of each practice, we embody savasana, the Corpse pose, practicing this letting go over our “control” and connection, even to the breath, so that we might be ready when the time comes, or at the very least, we will have considered it. You give our class and our lives the grace of your forthrightness, courage and brightness in the face of dark. I love it when you walk into class as you bring with you love, courage and, always, humor. Hello, Is there any way that you can show your exercises? My husband would love to see how a man does these positions. He feels that he has to compensate because of his male hip structure. Also, he would like to see pics of different people at different stages of their progress doing the exercises to get an idea of their progress. Thanks a bunch and keep up the good work!!! 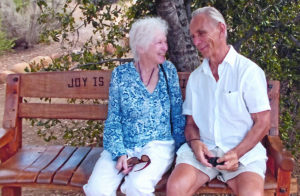 Thanks, Ian, for your story and wonderful to see the photo of you and Chandra, Joy Is ! Alignment classes have definitely had a super positive impact on my life resulting in an awaremess of how interconnected the mind, body and spirti are. Ian, thank you for taking the time to share your reflections. Your courage and perseverence through PD and loss of dear ones is truly amazing. Your zest for improving your life despite the obstacles presented is truly a gift worth sharing . Beautiful piece, thank you! I worked with a gentleman born during The Blitz who couldn’t speak for four years, developed ulcers all over his skin and was labeled “retarded.” Eventually he took up yoga and now at 79 is an instructor and loving life. Your story reminded me of his.